Cookin’ Calzones on the Beach! OK, so I kinda got confused when writing the last post. I actually saved out some of the filling from the casserole to make some calzones or empanadas or whatever you want to call them. I knew we were going boating the next day and so I wanted to have something to easy to eat on the beach. I just made the pizza dough and then used a medium sized bowl to cut out circles and used the filling from the day before and folded them over, baked them at 350 degrees. 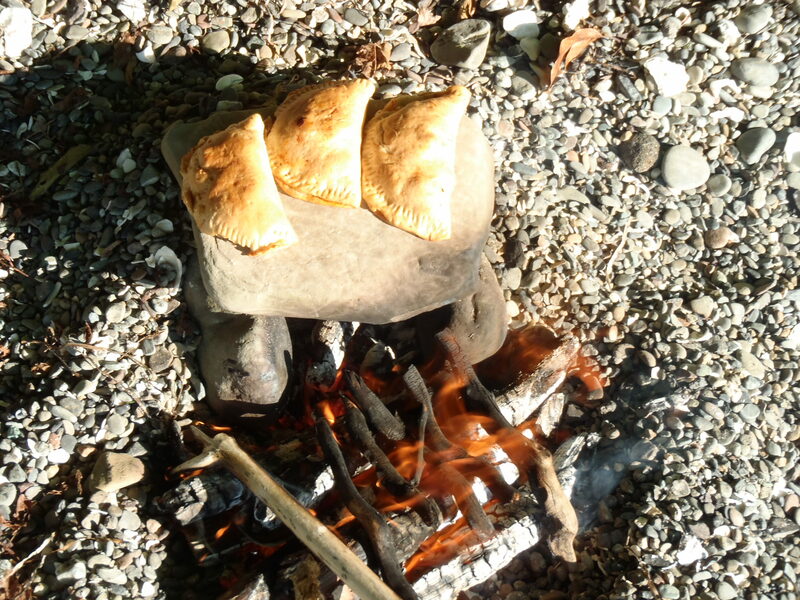 The kids had a great time on the beach, making an oven from stones and practicing their primitive skills. The reheated the calzones, toasting the bottoms perfectly and warming in the insides to melt the cheese. So yummy, the recipe made about 15 calzones. I made the husband’s pretty spicy, so when I was rolling out his dough, I added a few shakes of red pepper flakes and rolled them in. That way we could see which ones were spicy and the kids wouldn’t be whining on the beach about their sunburnt lips burning from chili peppers. I really hate that. But, if you do find yourself with raw lips and wanting to eat something spicy, a coating of chapstick works great. Just rub on before eating spicyness and voila! Protected lips! Here are some of our boating pictures. This entry was posted in Food For The Good Life, Simple Living and tagged good life with kids. Bookmark the permalink.